← GothWatch: St. Trinian’s Bonus! 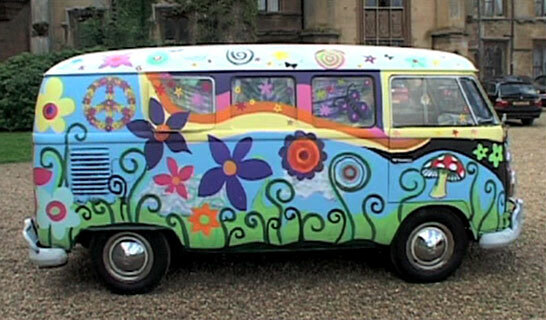 After Goth Chicks, I’d have to say that my next favourite (and most fancied) comedy archetype is the Hippie Chick. Of course, they don’t crop up in modern comedies as often as they did back in the day, but you can still catch an occasional sighting if you’re lucky. I’ve already written about the notable contributions that Sally Phillips has made to this field, in Hippies and Jam & Jerusalem… but I also used to have a huge crush on ‘Dharma’ (Jenna Elfman) from Dharma & Greg, when I first stumbled on the show. I can understand why people who actually lived through the 1960s/70s might find the portrayal of Dharma’s parents annoying at best and offensive at worst… but my attitude has always been that comedy can be used as a conduit to pass along serious ideas by osmosis, and that if a character is portrayed as a sympathetic fool (rather than a contemptible fool), then the audience might still absorb what the character is saying, or what the character stands for at their core, while they’re laughing at the surface foolishness. That’s just a theory though. No one likes to see themselves reduced and ridiculed as a sketchy “straw man”… and we all know there’s nothing funny ‘bout peace, love and understanding… but sometimes a little self-deprecating sugar can help the medicine go down. So to speak. Anyhoo, the most recent incarnation of this archetype occurs in St Trinian’s 2: The Legend of Fritton’s Gold, via ‘Celia’ (Juno Temple) and her tag-along tribe of “Ecos”. As I mentioned in my previous rambling post about the film, her character plays a pretty crucial part in kicking off the plot, and could also claim extra credit for engineering the denouement, but in-between we don’t really get to see or hear very much from her. She was also a rather peripheral character in the first film, unfortunately… and one of her best scenes ended up discarded on the cutting room floor. For shame! I‘m beginning to think that the “Meet the Tribes” bonus featurette might actually be my favourite part of this whole DVD, because it gives the individual characters a lot more room to breathe… and it was great to see Temple team up with the adorable Daisy Tonge, to brag about their manure-fuelled VW van and show off a skirt made from recycled bras! There’s also a neat line about how “homework is a waste of paper”, which is exactly the sort of character-specific, school-based humour I’d like to have seen more of in the film itself. Ah well, no use crying over spilt patchouli oil! This entry was posted in Rants about Films, Rants about TV and tagged Celia, Daisy, Daisy Tonge, Dharma & Greg, Hippies, Jenna Elfman, Juno Temple, Sally Phillips, St. Trinian’s. Bookmark the permalink.